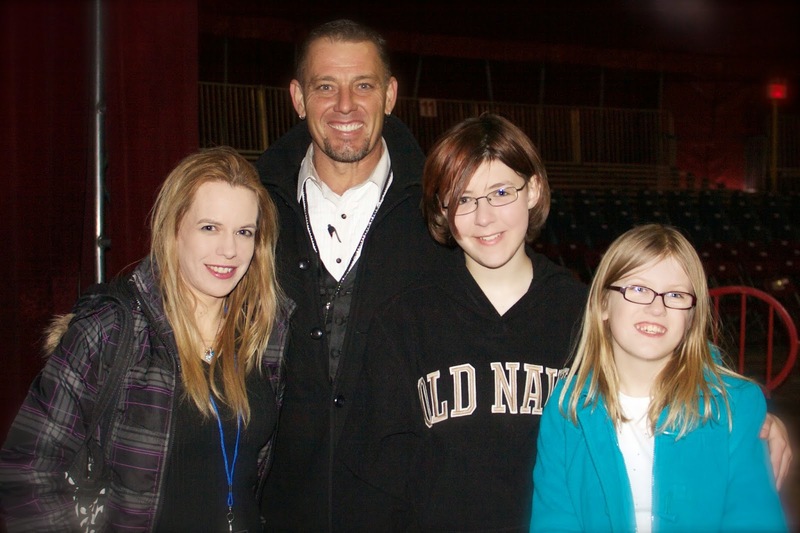 On Wednesday we were invited on a wonderful backstage tour of the Detroit Shrine Circus for opening night. I brought along my 2 daughters and my friend, photographer at Lasting Touch Photography, and her daughter. When we arrived I could not believe how big the tents are, but how close to the action the seats are. If you are looking for the best seats in the house pick either section 1 or 7. First we met the ringmaster, Richard Curtis. 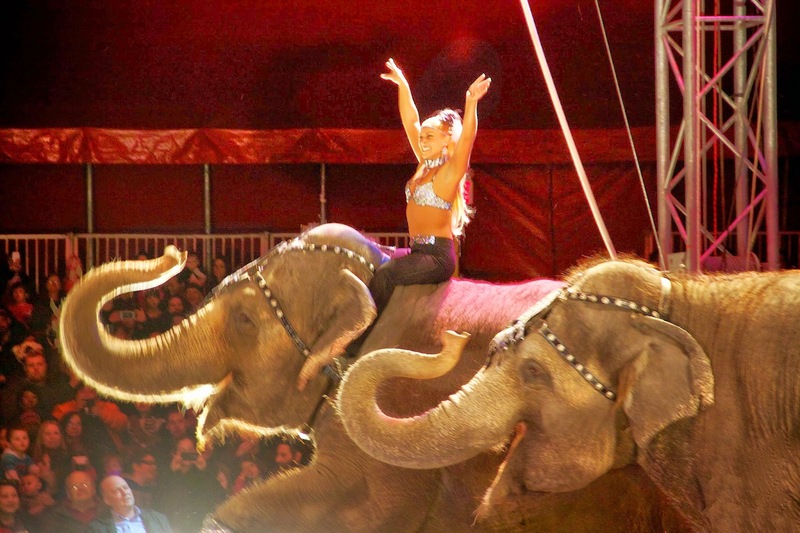 He married into the circus life 17 years ago. He told us about how they hand lace up the tent canvas and that it usually takes a couple days to set up everything. They have about 30-50 workers in their crew. Then he showed us where they bring in all the props from backstage. Next he showed us the barns for the tigers & elephants. My youngest was excited to hear the tigers making noise. He told us about how in their travels throughout the US & Canada that they like to take breaks at different ranches along the way to let the animals roam around & take it easy for a few days. Then we snapped a quick photo with him before he had to head back to work. As we learned many of the performers do multiple acts & have more than one job in the show. 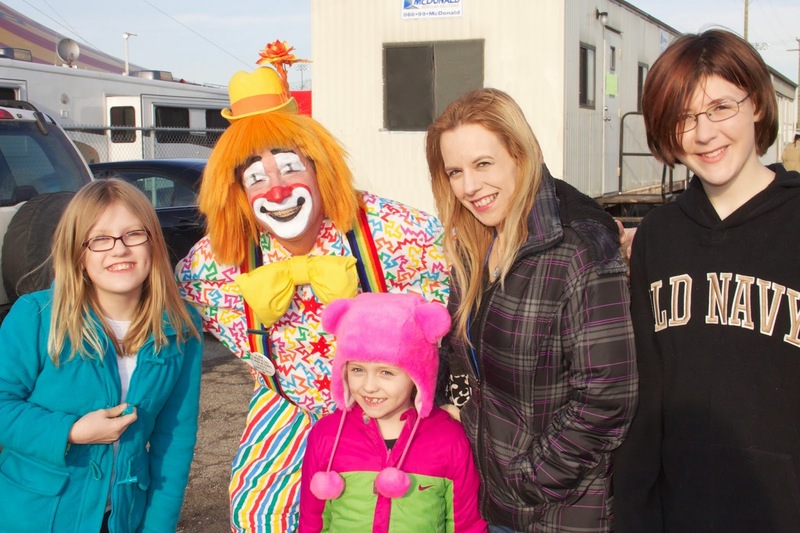 We met Piolita the clown & his 13 year old son, Christian, a 6th generation clown, doing face painting before the show. In the show not only did they clown around between acts but they also rode unicycles & played musical instruments. Christian said his favorite parts of the circus are bike riding, face painting, & interacting with all the children. Christian is home schooled and his favorite subject is writing. There is plenty to do before the show starts, so get there early. There is a Moon bounce with slide. There are elephant & camel rides. Our girls loved to feed & pet the animals at the petting zoo area. And of course grab some yummy fair food & Faygo pop. We had the opportunity to check out clown alley & interview a clown named, Fuzz-e. He is a volunteer who uses his vacation days to be a clown at the circus. He was so friendly & outgoing because as he said, he never met a stranger in his life. Any Shriner can be a clown. There are four classifications of Shrine clowns. "Whiteface," which is a classic European clown; "Auguste," which has variations of pink, red, or tan rather than white and wears a well-fitted costume or one that is baggy; "Character," which is typified by Red Skelton, Buster Keaton, and Charlie Chaplain; and "Tramp," which includes the hobo clown. 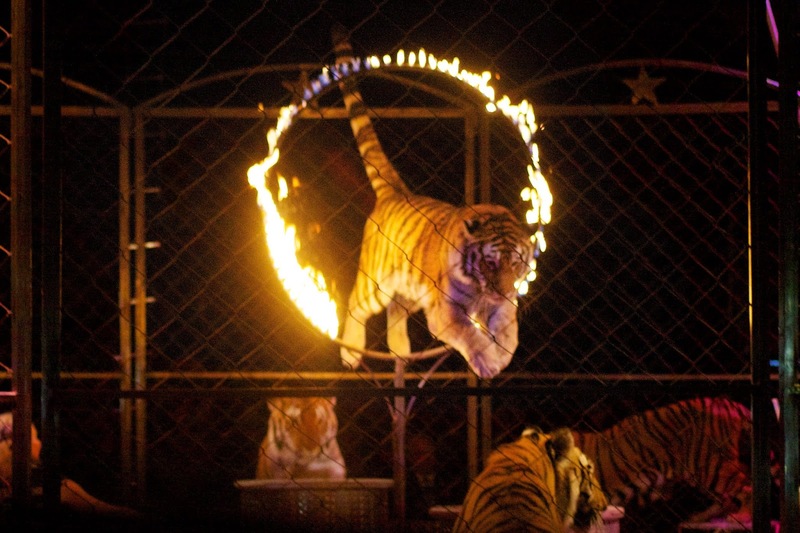 We had a great time watching all of the acts, which included a tiger jumping through a hoop of fire, the girls twirling around on scarves, the guys jumping on & off of horses, the elephants, the tight rope walkers, & more. They played popular songs during the acts like "Timber", "Happy", & "Let it go". My daughters enjoyed singing along. 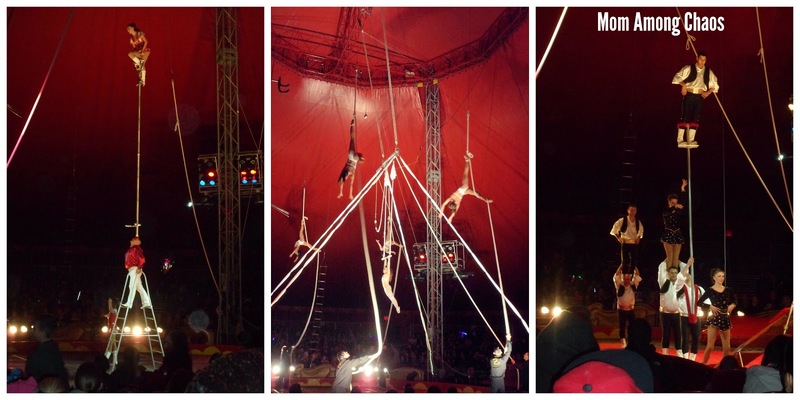 Make sure you stay until the very end of the show when all the performers come back out & walk around the ring. I think they deserve a standing ovation for such a magical show. Disclosure: Mom Among Chaos was given tickets to facilitate this review. Read our disclosure policy HERE.